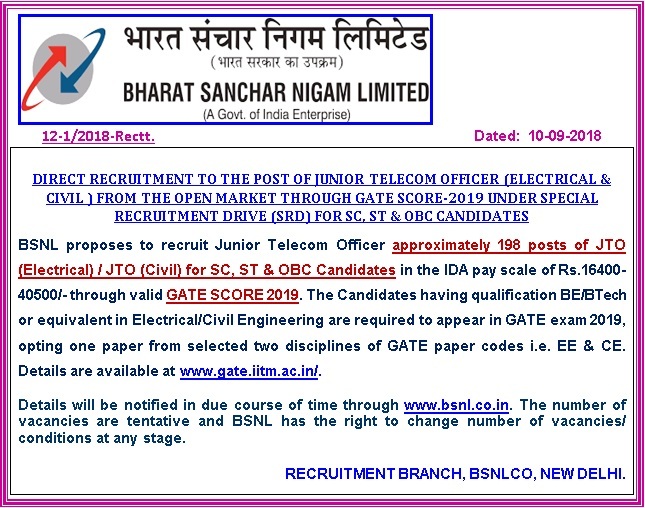 Bharat Sanchar Nigam Limited – BSNL Is Recruiting Junior Telecom Officer (JTO) Vacancy 198 For Recruitment 2018 Last Date 12 March 2019. BSNL Has Invited online Application Form For 198. Salary and Grade pay is 16400 – 40500 Rs/month depending on the post. Minimum Education requirement is B.E/B.Tech or equivalent in Electrical/Civil Engineering and qualified GATE 2019. from a recognized university or board. qualifying candidates should apply on or before Last Date 12 March 2019. Salary And Grade Pay (IDA)/वेतन प्रति माह – 16400 – 40500 Rs /Month. Education Required/न्यूनतम योग्यता: BE/B.Tech or equivalent in Electrical/Civil Engineering and qualified GATE 2019. Selection Procedure/ चयन प्रक्रिया – Selection will be based on GATE 2019 Score & Interview. How To Apply – Eligible candidates may apply Online through the website http://www.bsnl.co.in from 11.02.2019 to 12.03.2019.